The Rajasthan state experiences more or less uniform day temperatures over the plains except during the winter when temperatures increase southwards and during monsoon season when temperatures increase northwards. During the southwest monsoon the night minimum temperatures are more or less uniform but generally they are lower in higher latitudes. As compared to the plains the day and night temperatures over the plateau and at high level stations are lower. In the hottest month of May the mean maximum temperature is approximately around 41°C – 42°C in the plains, but it is 2°C to 4°C lower in the elevated and plateau regions of the state. 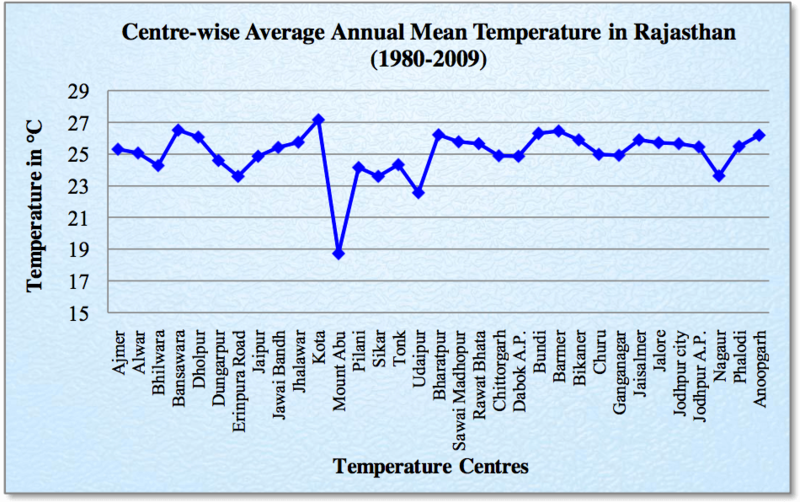 The Graph depicts the average mean temperature of Rajasthan district-wise from the year 1980 to 2009. The mean minimum temperature in the coldest month of January in the state is 7.4°C, which varies from 4°C in the north to 12°C in the south. With the arrival of western disturbances much lower winter temperature may be experienced. Minimum temperature 2°C – 5°C below the freezing point can be recorded at few stations of northern Rajasthan. In the past 50 years the lowest minimum temperature at a plain station ever recorded was -5.9°C at Jaisalmer on 12 January 1967 (12.8°C below the respective normal for the coldest month), while the hill station of Abu had recorded the lowest temperature of -7.4°C on 12 December 1994 (13.1°C below the respective normal for the coldest month). The maximum temperature rise rapidly from February onwards till May and minimum temperature from February onwards till June. The increase in maximum in the period from January to May ranges from 13°C to 20°C at individual stations as we proceed from south to north of the state. From the beginning of June to the end of July, the maximum temperature falls by about 3°C to 7°C whereas the minimum temperature falls only by about 3°C to 5°C from June to September. A slight rise in the maximum temperature is experienced in the month of September due to increased insolation. Post-September the night temperatures start falling rapidly while day temperatures too start falling rapidly after October and by January both attain their lowest values. There is about 8°C to 15°C fall in minimum temperature and maximum temperature fall by 5°C to 7°C. In both cases, the fall increases from southern parts of the state to the northern parts. Smallest diurnal range of temperature is experienced during July and August of about 9°C in the state. After the withdrawal of the monsoon the diurnal range of temperature increases. The diurnal range is greatest in November month.